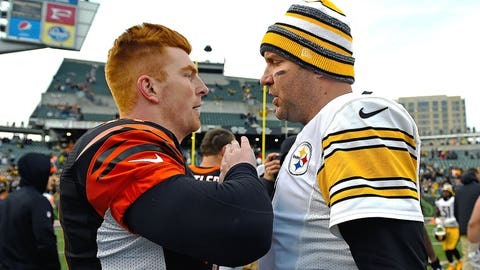 Ben Roethlisberger and Andy Dalton will face off on Sunday Night Football on the final week of the regular season. The Bengals regular season finale at Pittsburgh next Sunday has been moved from a 1 p.m. kickoff to Sunday Night Football. The Bengals (9-4-1) host Denver (11-3) Monday night but no matter the result, next Sunday’s game will determine the champion of the AFC North division. The NFL announced the move as part of its flex scheduling during the halftime of Sunday night’s Seattle-Arizona game. The Steelers beat Kansas City, 20-12, on Sunday to improve to 10-5 and clinch at least a wild card berth. It is Pittsburgh’s first playoff berth since 2011. If the Bengals beat Denver they will also clinch a playoff spot. The Bengals lost to Pittsburgh at Paul Brown Stadium on Dec. 7, 42-21, when the Steelers scored the final 25 points of the game and gained 229 yards in the fourth quarter. This will be the fifth consecutive season the Bengals have played at Pittsburgh in December. They are 1-3 in those games, winning 13-10 in 2012. That win clinched a playoff spot for the Bengals and knocked Pittsburgh out of postseason contention. The Steelers beat the Bengals 30-20 at Heinz Field last December on a Sunday Night Football game after jumping out to a 21-0 lead at the end of the first quarter. The Bengals can reach the postseason even if they lose both of their final two games but would need either San Diego (9-6) or Baltimore (9-6) to lose next Sunday. San Diego plays at Kansas City, while Baltimore hosts Cleveland.